1. i visited gypsy girl's guide this weekend (alex, the gypsy girl herself, is on maternity leave as she just had her little one) and i mused about the idea of self-portraits and shared a few things that make me feel strong and brave and beautiful. 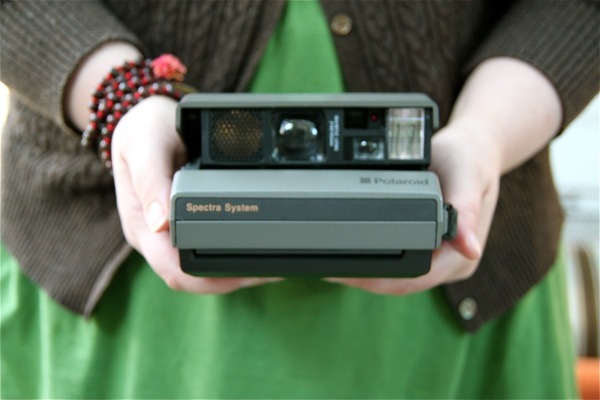 2. a "new to me" polaroid spectra camera is bringing a smile to my face. i have taken one of the three photos it still had in it when it arrived (and the photo was a good one!). i can't wait to learn more about the spectra and polaroids and lighting needed when taking a polaroid from maddie when she teaches at Reveal in less than two weeks. (and yes, the rumors are true, there are still a couple of spots left at this retreat. if you are reading this and suddenly have that oh my goodness i must check airline prices right now feeling...well, i hope you will as i would really love to see you [and, as a perk, you will get to meet this person AND hang out with this person who will be looking after the aforementioned little one]). 3. i am so thrilled to be a guest during one of the week's of jenna's fantastic e-course Alchemy: A Writing Course for Creative Souls. i have had some sneak peeks of this course, and to put it simply, it is going to be a very good thing. no way around it. i hope you will join jenna for so much goodness this october. 4. spent a bit of time doing a little etsy window shopping where i found (oh how i adore) this, (oh the blue!) this, and (oh i think i need) this. 5. watching ellie have a full conversation with the octopus that hangs from her activity mat thingamabob was a highlight of this weekend. seriously. that girl loves to talk. i am convinced that she says "hi" and "yes" but the others words i am not quite getting yet. 6. the little "one word" lockets i mentioned in my last post are now in the shop. i made myself my own "joy" simple locket as a much needed reminder. 8. oh and your preorders of my book...well...seeing them pop into my inbox is really making me grin. thank you. i simply cannot wait for you to read Inner Excavation! i have admit that today was filled with quite a bit of wallowing. i got bogged down by feelings of disappointment and less than and who do i think i am and fear and hurt feelings. i chose to close the laptop and take a break from all that stuff and focus instead on creating and watching the rain fall and seeking out the peeks of blue sky and listening to ellie coo and sharing a long hug with my husband. but how i wanted to wallow. still, i pushed myself (while kicking and screaming in my head). i pushed myself to seek out the goodness and the beauty and found my way to standing inside moments of happiness.